Road signs and landmarks give information about your location and the direction you are headed towards. To effectively interpret landmarks it is important to map out the changing scenes in your mind and recall the relative location of objects to one another. Being able to mentally manipulate the map and avoid getting lost is a key objective as the points of entry change along the way. 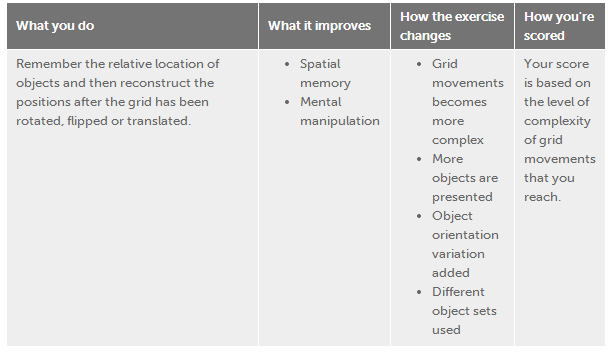 In this exercise, Mental Map, you should remember the location of objects in a grid relative to one another. Then you need to rebuild the grid once it has flipped, rotated, or translated, that is, moved down, up, left, or right. Training with Mental Map, exercises your ability to mentally create realistic maps of your relative location and mentally manipulating them for navigation.